The fictitious name of each girl is made to sound like various characters in the TF universe, and each part of every name is based on real names I’ve seen. See how many TFs you can identify. If a douche like Sam Witwicky (Shia LaBeouf) can score with babes like Mikaela Banes (Megan Fox) and Carly Spencer (Rosie Huntington-Whiteley), then Spike hooking up with all these cuties below is not so far-fetched. Hover the mouse over each girl’s name to see the name of the TF. You win nothing by correctly identifying them all, but you can take pride in the fact you know so many Transformer names. Happy Thanksgiving everyone! Transform and Roll Out! This past summer, me and the GF took a trip to Asia. First we went to Japan. We hit several cities while in Japan, including Tokyo, Koyto, Nara, and Kobe. Then we went to Shanghai, China (where the GF is from). After that I went to Taipei, Taiwan by myself (where I’m from). The entire trip was a little over 2 weeks. I had the time of my life! This was the best trip I have taken in quite some time. While we were in Shanghai, the GF had to show me Jing’an Temple. Actually, we stayed pretty close to the Temple, within walking distance. Jing’an Temple is right in the heart of the city, and it is a must visit if you are in Shanghai. 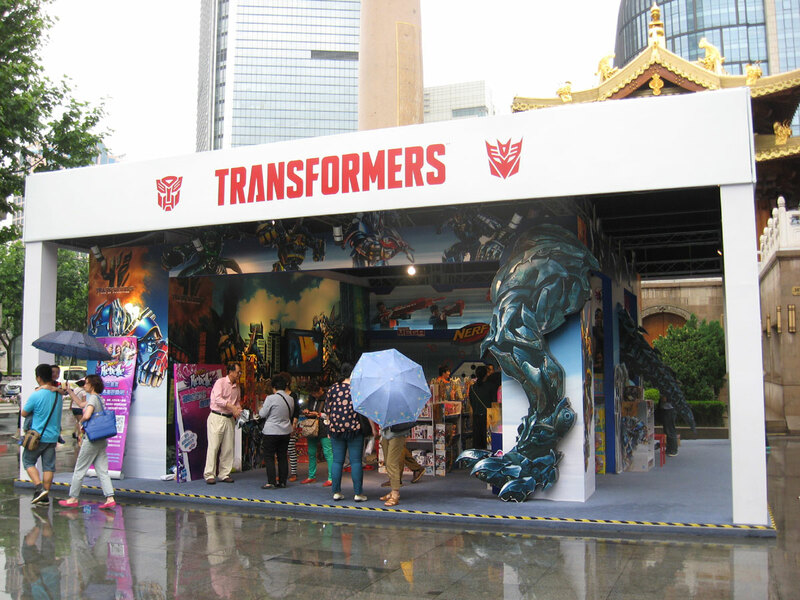 I was there around June 1st, and wouldn’t you know it, they were doing a Transformers Age of Extinction promotion right next to the Temple! They had a booth set up right beside the Temple. It’s like they knew I was coming! Look at the first pic below and you will see the booth, and parts of the Temple right behind it. 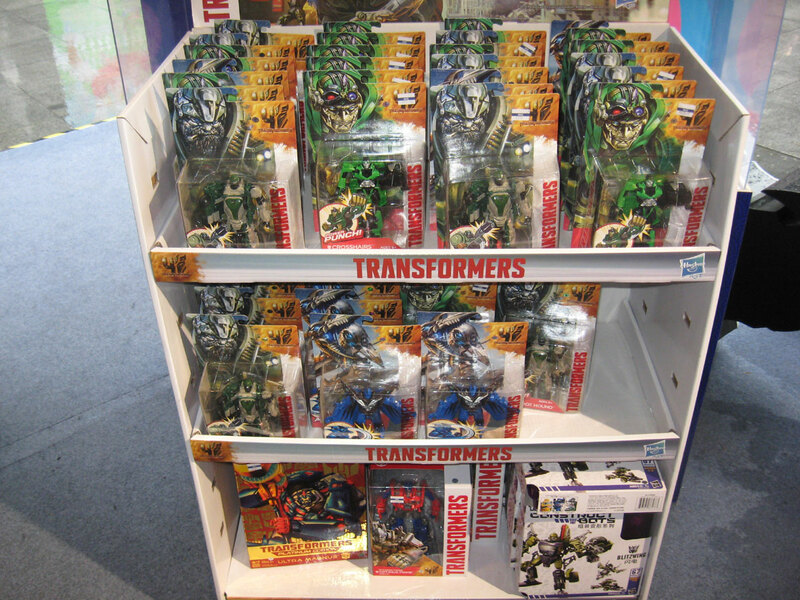 In the booth were many TF figures, not limited to AoE toys. I was seeing many of the AoE figs for the first time. Prices weren’t that good though. 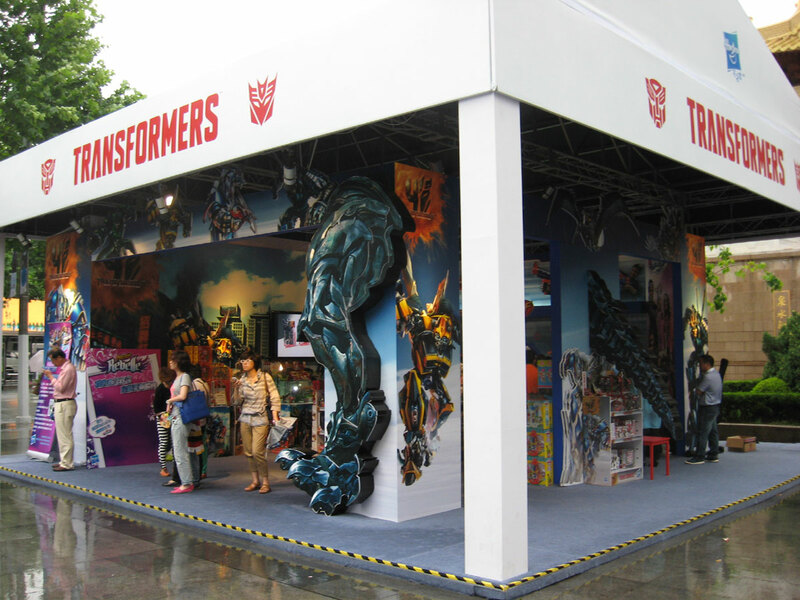 TFs in Asia are typically double the cost, and this particular location is a total tourist trap. So I didn’t buy anything til I got back to the States. 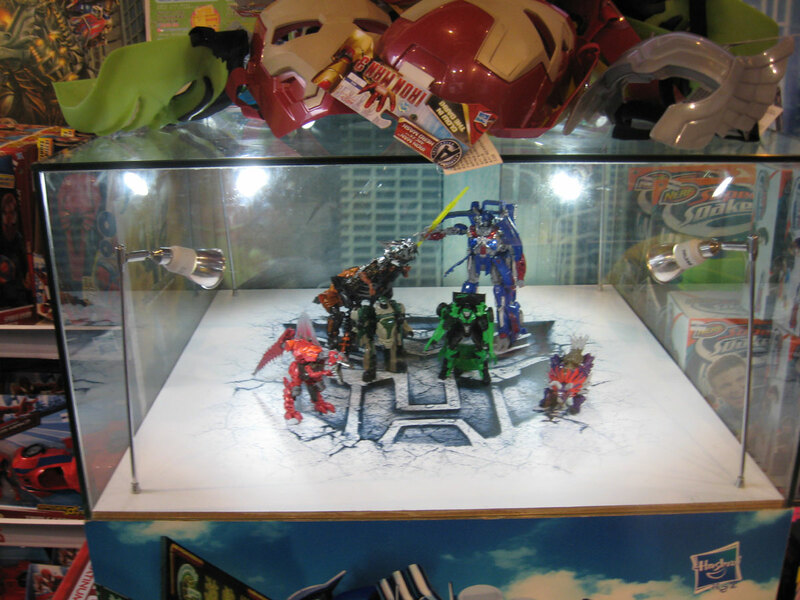 But seeing the AoE booth with a large Grimlock display was still quite cool. Check out pics below. 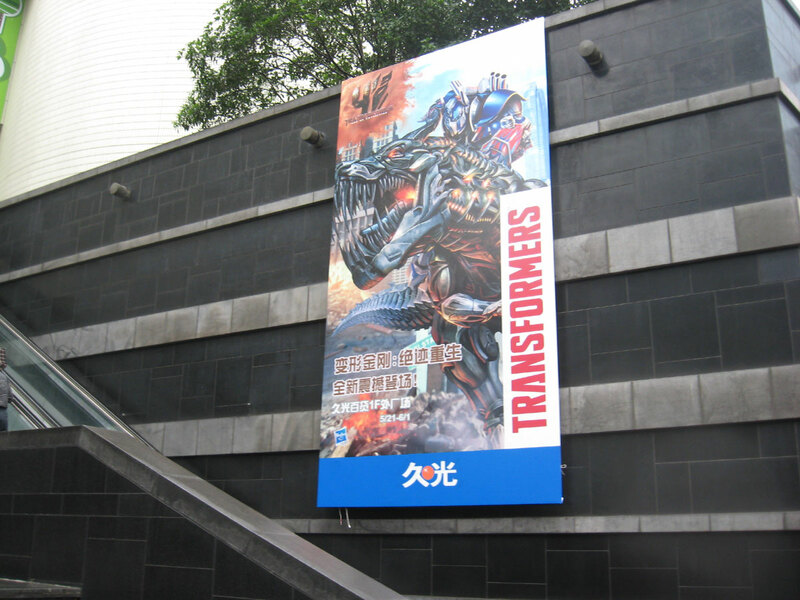 After seeing Age of Extinction, it becomes obvious why promotion in China is absolutely necessary. I won’t explain it. See TF4 for yourself. And after seeing the movie, check out this Honest Trailer for TF4. Shanghai is so cool! Transform and Roll Out! 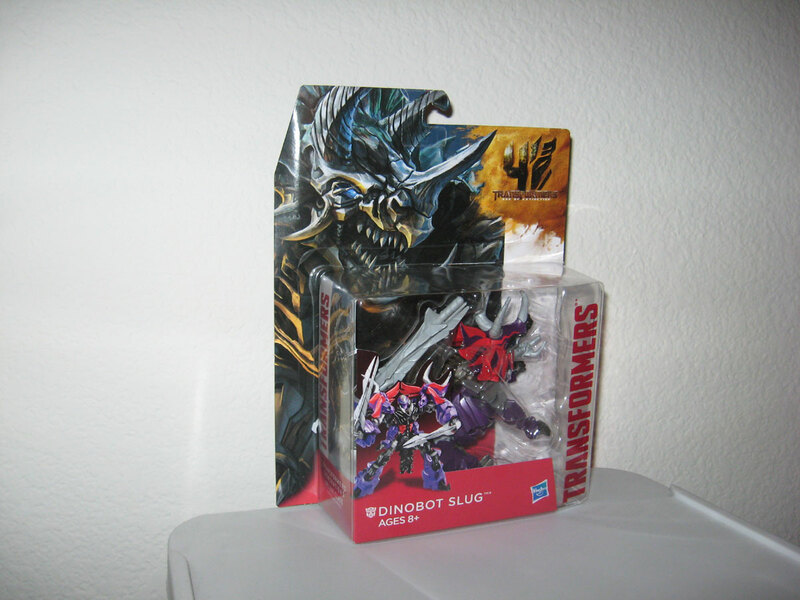 Around May of this year was when Age of Extinction toys started to appear. I started to see them in early May, but I wasn’t able to purchase any until late May. More on this later in the post. Here are my acquisitions for May. Other than Hardbone, all figures are from Age of Extinction. 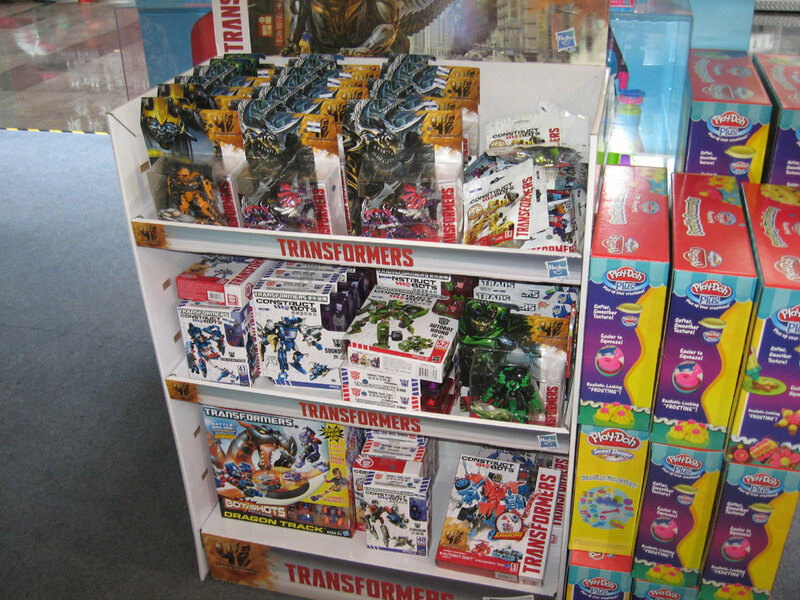 The release of AoE toys finally ends a long retail TF drought that lasted for much of the year. I was happy to see some new figs on the shelves, but at the same time I knew that Hasbro’s focus on AoE figures would also equate to less attention on the Generations line, my favorite TF line from Hasbro. Still, seeing something I want on the shelf is always better than seeing nothing. 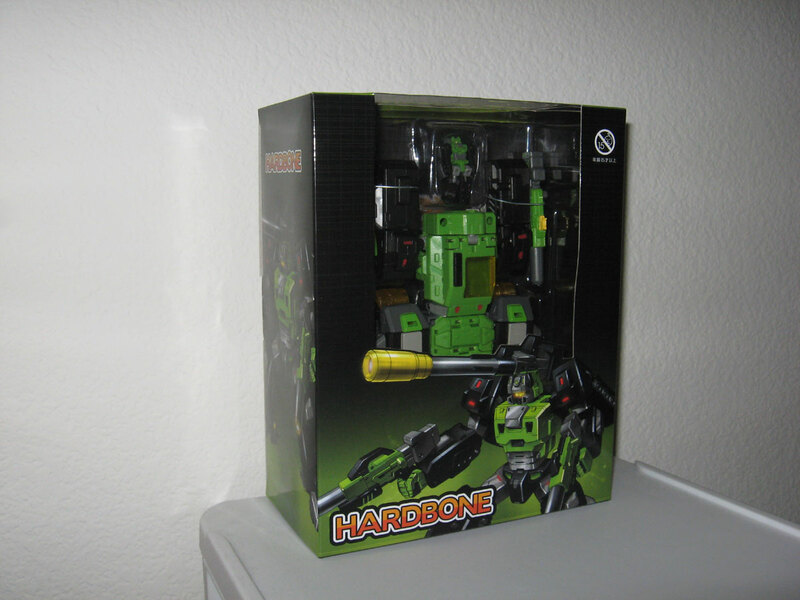 But before I get into AoE, let’s talk about Hardbone, ToyWorld’s homage to G1 Hardhead. I actually bought this figure late last year, around Thanksgiving I believe. BBTS was doing their Black Friday sale. Only thing I wanted from the sale is Hardbone. As a whole, I’m very impressed with figures from ToyWorld as I think they all have solid construction, nice design, good value, and G1-inspired aesthetics. And I saw good reviews of Hardbone on YouTube, so I wasted no time to buy one at the sale. I always use the Loot feature at BBTS, to save on shipping. However, between then and May, I bought nothing else from BBTS. Any item in the loot can only be held for 6 months, so in May I had to ship Hardbone. I was not disappointed when I received the figure. Both modes look nice and the figure is well built. Transformation is not anything revolutionary, but in this case the tried and true formula works. Hardbone has weapons galore. Obviously he’s got his big shoulder cannon, but the twin guns that he had in G1 are here as well. And TW included some extra weapon accessories for good measure. The Headmaster gimmick itself is not really improved upon for G1, but suffice to say that it’s there. Overall I think this figure is an excellent modern update of G1 Hardhead. OK, now onto the Age of Extinction figures. In early May I first saw them at K-Mart. I found the first 4 deluxe figs from Wave 1, which are High Octane Bumblebee, Crosshairs (not pictured), Slug, and Scorn. I tried to buy Slug and Scorn, but at checkout they would not ring up a price. So they wouldn’t sell them! K-Mart said they were put on the shelves by mistake. Lame! Anyway, less than 2 weeks later I found them elsewhere (and pretty much everywhere). 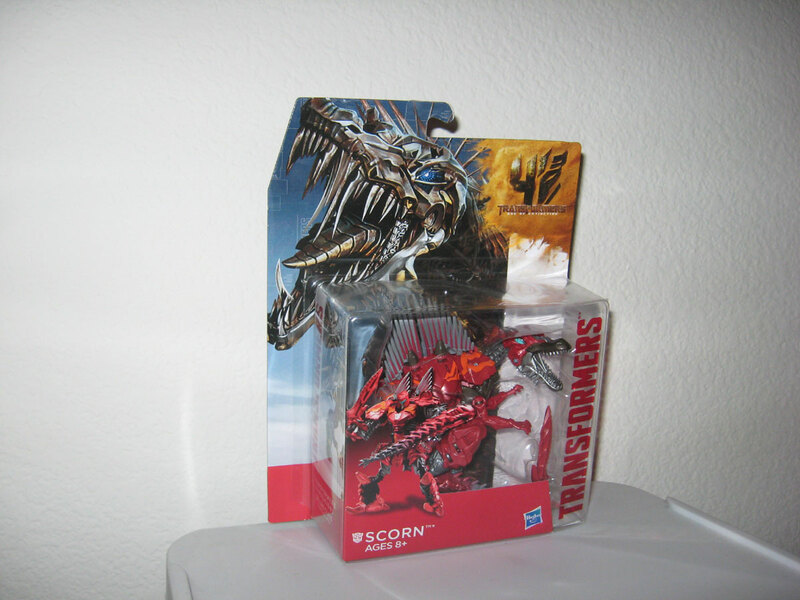 When I first saw the AoE figs, I definitely wanted the Dinobots. Robots transforming into Dinosaurs are some of the best ideas Takara has came up with, and the G1 creators were smart enough to personify them as the bad asses that they are. So I’m kinda surprised that Hasbro doesn’t milk this more by making Dinobots all the time, in whatever is the active TF continuity. At least for the 4th movie, Michael Bay was smart enough to include them (minor SPOILER ALERT, highlight over the next sentence to see: they only appear at the very end, for about 15 minutes. LAME!). Anyway, as for the figures themselves, I like Scorn. He’s my favorite of all the deluxe Dinos released so far. I like both the dino mode and the robot mode. Slug is ok. He’s obviously a homage to G1 Slag, being a triceratops and having a oh-so-clever name change. These movie dinos sure are colorful, like Power Rangers. In the movie they are more metallic looking, like G1 Dinobots. I bet in the future Hasbro will make limited editions of these guys in movie colors. 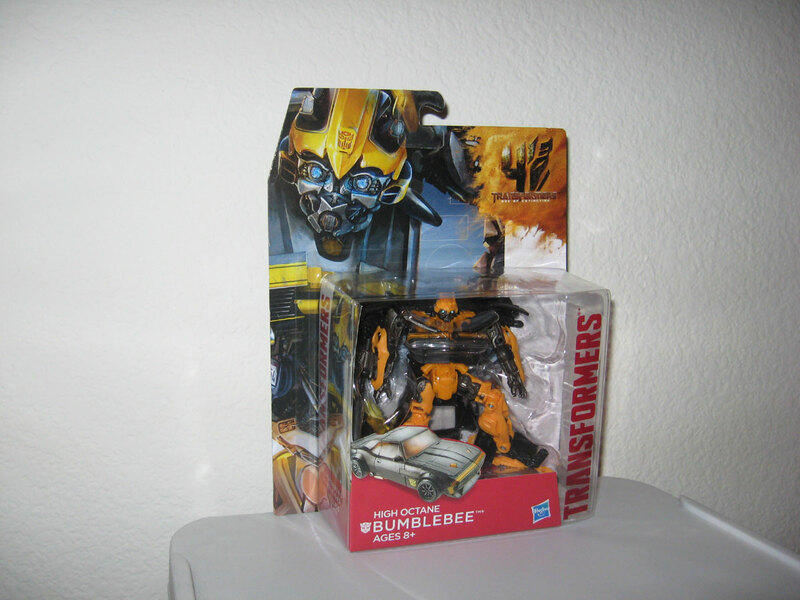 I like the Bumblebee figure. At the core, he’s not anything that we haven’t seen before in a movie Bumblebee. But I’m digging the classic muscle car (it could be a classic Camaro, but I could be wrong). The only other time they made a classic car movie Bee was in the first movie (which I have and broke), so it’s good to see him in this form again after all the modern Camaro Bees. 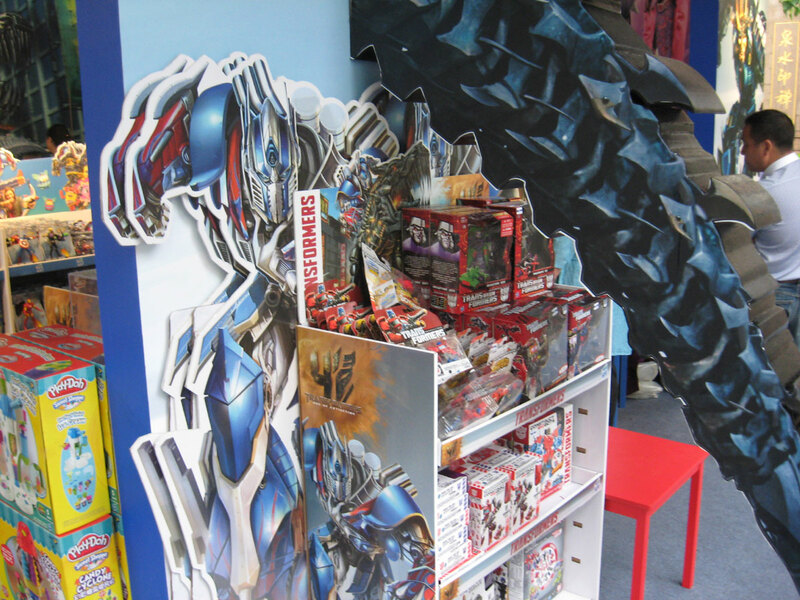 Last but not least, there’s Evasion Mode Optimus Prime. When I first saw preview pics of this figure, I was beyond thrilled. That alt mode is so G1 it would be illegal for me to not get one. The robot mode is still has the signature Michael Bay look, but with more G1 aesthetics and colors (though in the movie he does not appear in these colors). The transformation of this piece is actually very refreshing. The legs are kinda the same as always for Prime figs, but the upper body transformation utilizes quite a interesting twist. It’s as if the cab folds inside out on all sides to form the upper torso. 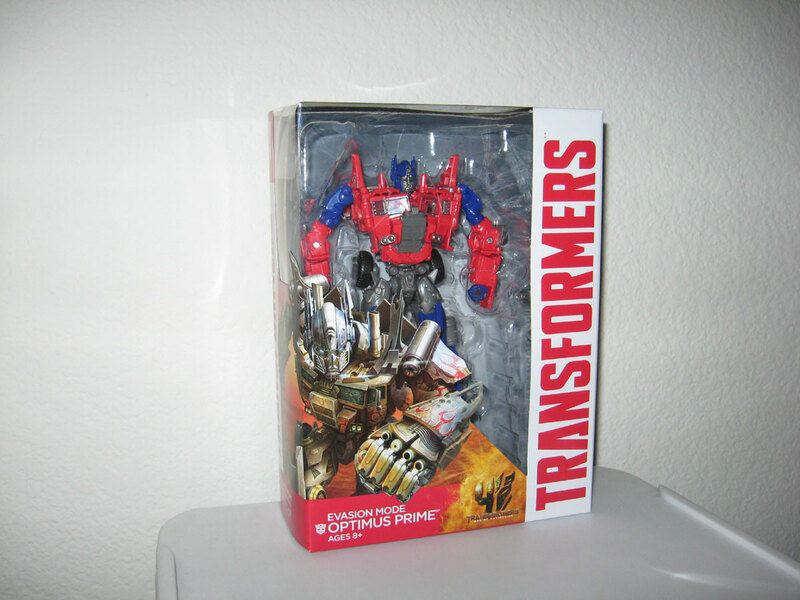 The result is a nice movie-verse figure that mixes well with G1. I recommend this Prime, and with this upcoming aftermarket accessory to make him look like Powermaster Optimus, I say all G1-ers should get this fig. That’s all for now. 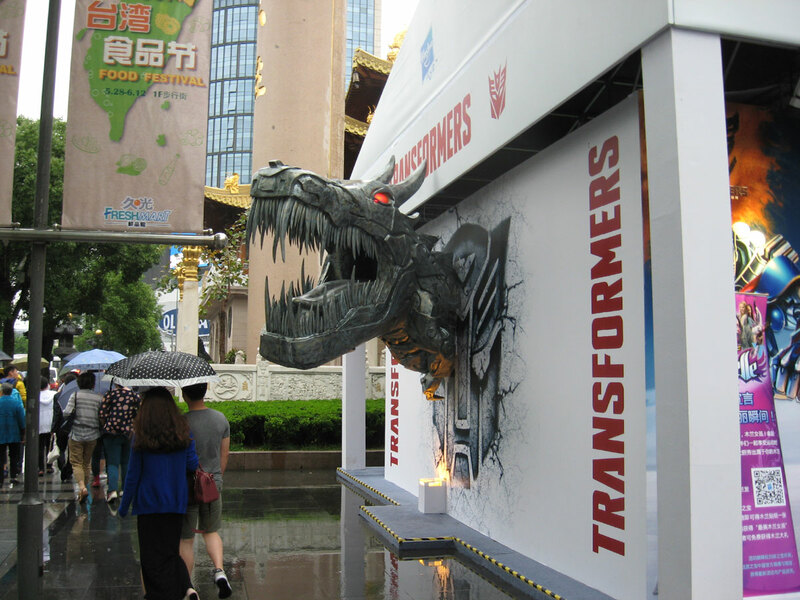 Age of Extinction has arrived… Transform and Roll Out.